Hanim came to Latte Da in 2007. 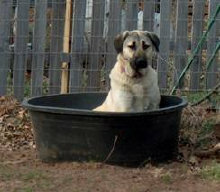 Faithful, loyal and bit of a trouble maker !...are just a few words to describe this unusual breed, the Kangal. Most importantly, she is fiercely protective of her charges. She lives not only WITH the goats, but loves to be in the middle of everything they do and is truly part of the herd. She is extremely unhappy if she is separated from them & will fuss until she can return to where she knows she ‘belongs’. Hanim received her UKC Championship in 2008 ! Chuck joined the Latte Da family in 2012. 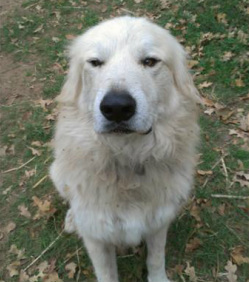 This happy guy was a rescue Great Pyrenees. He was clearly a working dog looking for a job to do, and he does his job VERY WELL. Phaedra & Stevie (mother and son Akbash 'team') the day they arrived at Latte Da !...immediately went to work in our yearling pen. Later we moved Stevie in with Hanim and the milkers to keep her company. ​Below, Spot introducers herself to them and sets some "ground rules"..."I'm in charge here !!!" Note the submissive posture of Pheadra...Such a perfect guardian dog !! !